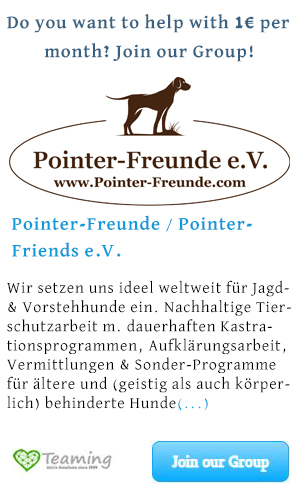 Protection Fee - Pointer-Freunde e.V. Have you decided to take a dog from the animal welfare and give it a new home?! Perhaps have you have then already dealt with the question of local but also of international animal welfare? In this context one always finds terms such as “animal adoption agreement”, “protection fee” or even “partial flight costs”. A “protection agreement” or with us “animal adoption agreement” is not a purchase contract. We do not sell animals; you can adopt animals from us. A “protection fee” is not a purchase price” – it fulfills rather different purposes: Coverage of accrued costs and also creates a “barrier” not to get a dog thoughtlessly. In addition to these basic costs, there are many other further costs that are usually forgotten: Accessories (bowls, leashes, collars / harnesses), shampoos, food supplements and homeopathy for the immune system, trips to the vet and the foster care, transport boxes, etc. Often dogs that have been taken in or have been rescued from the street need special health treatment. Also operations and physiotherapy are once in a while necessary to provide the basis for a healthy life for the dogs under our protection. Here costs can very quickly amount to a small fortune; especially for a non-profit making Association such as the Pointer-Freunde / Pointer Friends e.V. The sum of an adoption fee (protection charge including airfare) can therefore not cover all the costs. The protective fee incl. flight costs are always a mixed calculation: The costs for younger dogs or puppies are often not as high as for older or maybe sick or injured dogs. We have decided therefore deliberately on a uniform adoption fee to provide fair opportunities for a new home for all dogs under our protection. Since, for us all dogs are equally worth a “lot”. The fee will be due upon conclusion of the animal adoption agreement. You can pay us by bank transfer to our bank account or through PayPal. In exceptional cases we accept also cash against receipt. (Just to clarify: Should the dog in the unlikely event be returned to our Association, a refund of the adoption fee (protection charge including airfare) is not intended. This is true after a week as well as after one year.